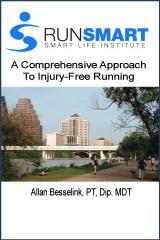 "The Injured Runner: An Evidence-Based Approach" is a two hour presentation that I gave to the Capital Area District of the Texas Physical Therapy Association on March 24, 2009. The first set of slides is an overview of the scientific evidence related to running injuries and their assessment and treatment. The second set of slides is an overview of the RunSmart approach to running injuries, which is detailed in the book "RunSmart: A Comprehensive Approach To Injury-Free Running".